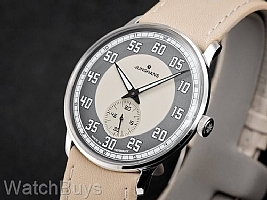 Pulling elements from an era considered the "golden age" of car manufacturing and intertwining them with the rich history of watchmaking, the Junghans Meister Driver Hand Wind Tan Dial delivers a true blend of nostalgia and class. The Junghans Meister Driver Hand Wind Tan Dial honors its historical roots by uniting exceptional quality and craftsmanship with modern style. The dial of the Junghans Meister Driver Hand Wind Tan Dial is very reminiscent of the dashboard speedometer. A distinctive lacquer finish underscores the three-dimensional aspect of the domed crystal and the nostalgic charm of the timepiece. The Junghans Meister Driver Hand Wind Black Dial displays a color combination based upon the paintwork of the classic car: dark anthracite and tan. To ensure optimal readability even during moments of darkness, the large numerals and bold hands feature SuperLuminova. This watch is powered by a hand-winding movement (J815.1) which again parallels its historical roots, as the first car clocks were also hand wound. The dial also features a small seconds at 6.